Venice, Louisiana: Kinship Circle has gone where few other animal organizations have been: Into the trenches of the Deepwater Horizon oil spill in the Gulf. We are there right now, in an investigative capacity to document oil-affected animals and alert Unified Command where they are. Animal rescue groups -- other than specialized organizations authorized under Unified Command -- currently do not have access into restricted zones. But select press and documentarians do. Kinship Circle was asked to "embed" with acclaimed documentary filmmaker Tom McPhee for his All Eyes On The Gulf (AEOTG) expedition. Our disaster responders are on the ground to focus camera lenses and notepads on contaminated parts of Louisiana, Florida, Alabama, Mississippi and Texas. AEOTG is a scientific tour to collect visual records. It’s also a window to the truth. As part of AEOTG's crew of filmmakers and photojournalists, Kinship Circle may deploy teams through August, as funds permit. Tom McPhee's organization, World Animal Awareness Society, is approved under Unified Command (BP, Coast Guard, fed/state officials) to access affected areas. All team members wear photo ID badges. On 6/10/10 U.S. Fish and Wildlife reported that more than 400 oiled birds were taken to Fort Jackson Oiled Wildlife Rehabilitation Center in Buras, Louisiana in a span of several days -- over five times as many than in the last six weeks combined. Where are the photos and clips? According to CNN, BP is attempting to block reporters from photographing animals altogether. Tom McPhee's All Eyes On The Gulf is a portal to the "human/animal intersection" in this disaster. Team members undergo two-day training before they journey to oil damaged regions across five states. Volunteers gather visual evidence from ground, water and air levels. They act as "spotters" to give Unified Area Command location coordinates for suffering animals and facilitate their capture and care. Detailed data collection procedures are used and volunteers are prepped for encounters with oil distressed animals. As evidenced by Kinship Circle's aid in Chile's 8.8 quake and tsunami -- disaster response is expensive. We’re rarely involved in two catastrophic missions at the same time. 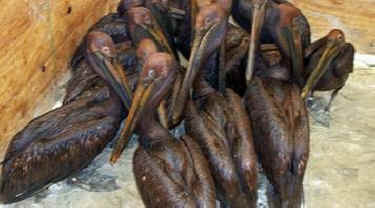 But as animals are treated for wounds and disease in Chile...victims of BP's oil spill await aid in the U.S. Core mission: To focus a lens on human-animal interactions and to share this information with the world. 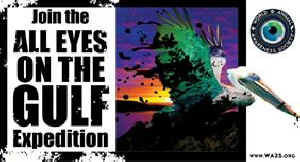 World Animal Awareness Society is documenting the Gulf oil spill for historical, educational and research purposes. Visual data will be archived indefinitely and distributed via WA2S.org.